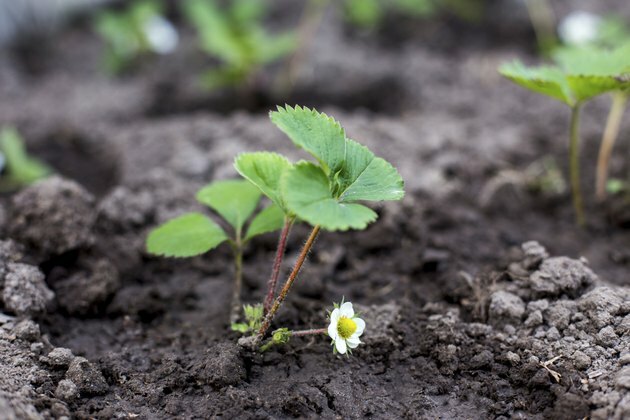 You can save and sow seeds from your favorite garden strawberries (Fragaria x ananassa), perennial in U.S. Department of Agriculture plant hardiness zones 3 through 10, but most are hybrid cultivars that won't come true from seed. On the other hand, purchased or saved seeds for wild strawberries (Fragaria spp., USDA zones 4 through 10), or open-pollinated garden types such as "Fresca" (USDA zones 3 through 8) will come true. Sellers also offer seeds of hybrid decorative garden varieties, including "Tarpan" (USDA zones 5 through 8), which are grown for their unusual pink flowers as well as their berries. A young strawberry plant seedling. To harvest strawberry seeds from their fruits, place four or five berries and 1 quart of water in the pitcher of a blender. After covering the blender, run it on its lowest setting for 10 seconds. Discard any seeds that float to the surface, as they won't be viable, and pour the mixture of water and strawberry pulp through a strainer that has mesh that's fine enough to retain the seeds. Hold the strainer over a sink or place a container beneath it to catch the watery pulp. When the seeds are completely drained, spread them on paper towels and allow them to dry thoroughly. Store saved or purchased strawberry seeds in a paper envelope inside a covered glass jar or zip-lock plastic bag in the refrigerator until one month before you intend to plant them. If you want to harvest strawberries the same year that you plant their seeds, you must sow the seeds indoors no later than the beginning of February. One month earlier than the planting date you choose, place the jar or bag containing the seeds in the freezer. After the month has passed, retrieve the container from the freezer, and leave it at room temperature overnight before you open it to plant the seeds. Make sure the flowerpot or other container you use for sowing the seeds has drainage holes. After filling it to within 1/2 inch of its rim with damp, sterile seed-starting mix, sow the seeds about 1 inch apart over the surface of the mix. Press them into the surface and leave them uncovered, as they require light for germination. After topping the container with plastic wrap, place it under a grow light set to run for 12 to 14 hours per day or on a sunny -- preferably south-facing -- windowsill. If you keep the container at temperatures between 60 and 75 degrees Fahrenheit, the seeds should germinate within one to six weeks. For the first month, feed the plants once every two weeks with a fertilizer recommended for seedlings, such as liquid kelp (0-0-1). Use only half the amount specified, which for the kelp would be 1 tablespoon of the concentrate per gallon of water. After one month, you can raise that to the full amount of 2 tablespoons per gallon every two weeks. About six weeks after the seedlings germinate, transplant them into individual 4-inch pots of potting soil. They should be ready to go outdoors after another six weeks. Place the pots in the shade at first, accustoming the plants gradually to more and more sun before you transplant them into the garden, setting them 2 feet apart in well-drained, slightly acidic soil in full sun. Work 1/4 cup of an all-purpose organic fertilizer such as 5-5-5 into the planting hole for each seedling, water them well and mulch them with straw. To stay healthy, the strawberry plants will need at least 1 inch of water per week from rainfall or irrigation.